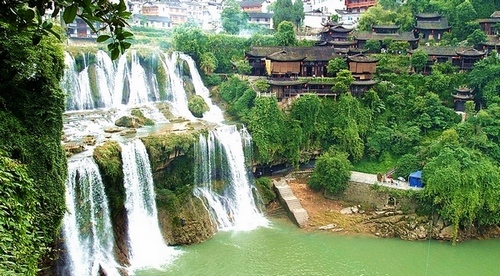 Situated in the western border area of Hunan Province, Fenghuang(Phoenix) Ancient City is a famous historic and cultural city. 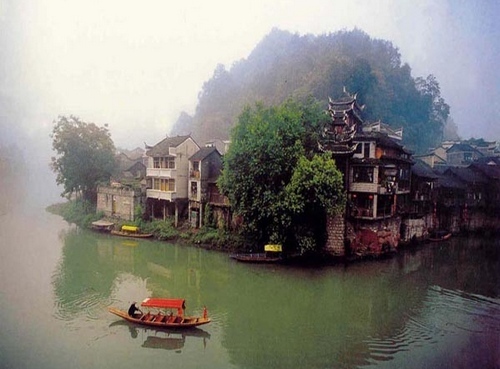 It was ever praised as "the most beautiful small city in China" by Rewi Alley, a renowned author in New Zealand. 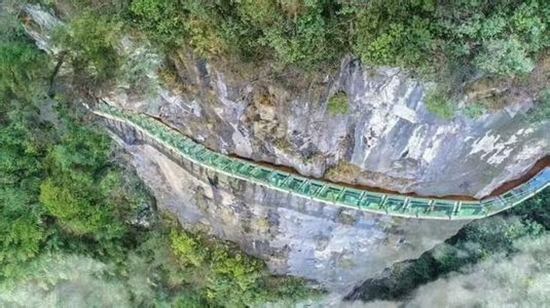 Aizhai cliff plank's first part of the investment is about 20 million, Its total length is 1.5 kilometers and the vertical drop is 500 meters, and including 100 meters of glass path.It is located on the cliffs of Dehang Grand Canyon. 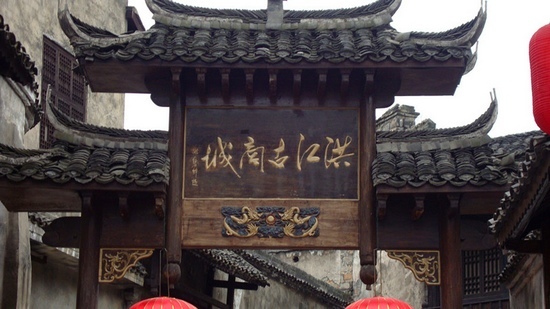 This plank road is designed using modern Miao culture elements such as "Butterfly" and "Ribbon". Dramatic "Ups and downs" and "Thrilling" tourist skywalk attractions. Feng Huang is Chinese for Phoenix, the mythical bird of good omen and longevity that is consumed by fire to be re-born again from the flames. Feng Huang Cheng or Phoenix Town is so called as legend has it that two of these fabulous birds flew over it and found the town so beautiful that they hovered there, reluctant to leave.The town is situated on the western boundary of Hunan Province in an area of outstanding natural beauty where mountains, water and blue skies prevail. Upon entering the town the visitor will be impressed by its air of mystery, elegance and primitive simplicity. This is a world that is dominated by the colour green. The mountain slopes are covered with green foliage, the fields are green and even the Tuo Jiang River reflects the greenery. The bridges over the water and unique houses built on stilts display a harmony that is so often portrayed in traditional Chinese paintings. This is particularly true when mist pervades the scene in the early morning or after rain. 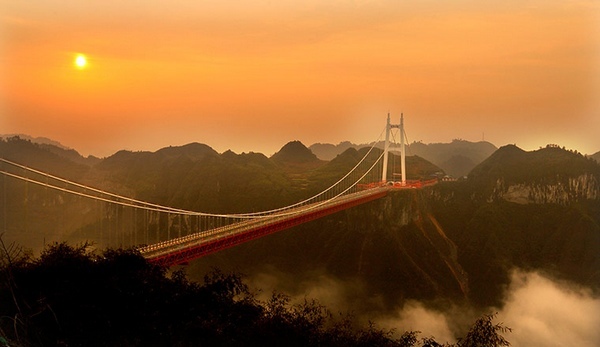 It soon becomes apparent that the claim to being one of the two most beautiful towns in the whole of China is more than justified; the other town is Chang Ting in Fujian Province. Feng Huang Cheng is a wonderful example of what villages were like prior to the onset of modernization. Here dozens of alleys paved with flagstones run between the houses, each showing wear caused by the feet of generations of local people who have used them when going about their daily business. 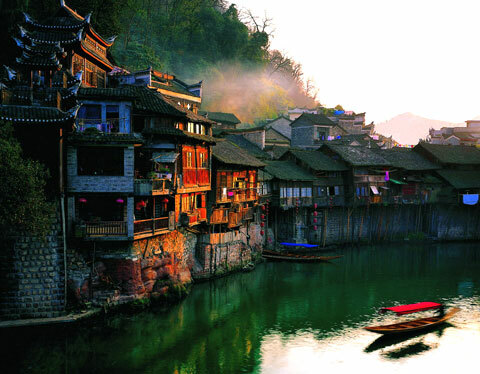 For the visitor, these alleys are the way to see the typical high gabled wooden houses built on stilts along the banks of the Tuo Jiang River at close quarters.Stretching diagonally from the northwest to southeast of the town, Tuo Jiang River is a life force of the local people. Here in its waters women wash their clothes and the men fish with their nets, while on the bank food is prepared in much the same way as it has for centuries. The river also provides a means for boatmen to support their families by ferrying tourists up and down stream so that they may admire the many splendours of the town.The Miao ethnic minority is predominantly settled here and a visit to a Miao village is a must when going to Feng Huang Cheng. 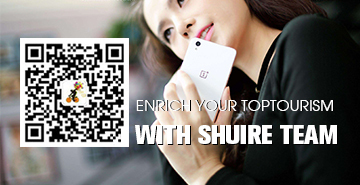 The Miao women have a natural beauty that renders the use of cosmetics quite unnecessary. They love to dress in traditional blue garments set off with a white scarf. They love also their silver jewellery especially during festivals. Visitors will find a large array of hand made items of silver ornaments for sale in the local shops. Home made tie-dyes, printed and batik cloths are other local specialities that make wonderful souvenirs. 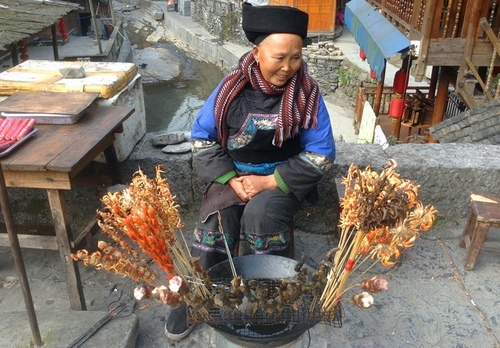 The Miao are friendly and hospitable and like nothing more than to interact with visitors with a variety of traditional entertainments and activities. Food here also is different from that found elsewhere in China. Pickled red peppers are a particular local delicacy and their appetizing smell wafts from the many small family run restaurants..Feng Huang Cheng was home to the versatile writer Shen Congwen (1902-88) who contributed greatly to the development of modern Chinese literature. Venerated by the local residents, the one time home and the tomb of this famous writer have become tourist attractions.There are two other notable people from the town worthy of mention. The first is Xiong Xiling the famous philanthropist who was the first premier of the Republic of China (1921-49) following the fall of the Manchu. 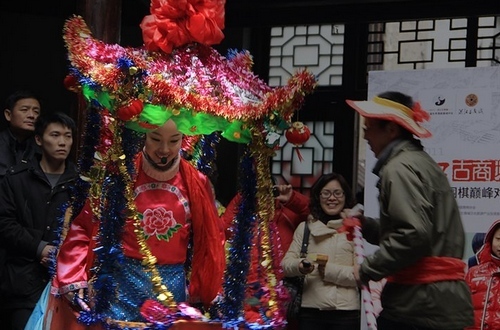 The other famous citizen is Huang Yongyu, an outstanding contemporary painter in the traditional Chinese style. His frescoes illustrating Buddhist stories in the Zhunti Nunnery are a major tourist attraction.. Feng Huang Cheng does not rely entirely upon natural beauty to attract the visitor for this ancient town with a history spanning 1300 years has a number of remarkable old gardens as well as distinctive residential buildings, elegant bridges and mysterious towers and pagodas. These architectural delights date from the Ming and Qing Dynasties (1644-1911). Those of special interest are the Wengchen Pavilion, Huang Si Qiao Castle, Tian Wang Temple, Da Cheng Hall, Chao Yang Palace, and the tomb of Shen Congwen and the residence of Xiong Xiling. Here too there are the North Gate and South Great Wall both excellent examples of municipal fortification.In many ways, life has not changed here for centuries and this is typified by the tough, hard working yet simple-hearted people. Feng Huang Cheng offers the visitor from both home and abroad a view of a quite different China from anything experienced in the modern cities and large conurbations that are more widely known. We are sure that the opportunity to travel in such a picturesque region will be remembered as an experience of a lifetime. 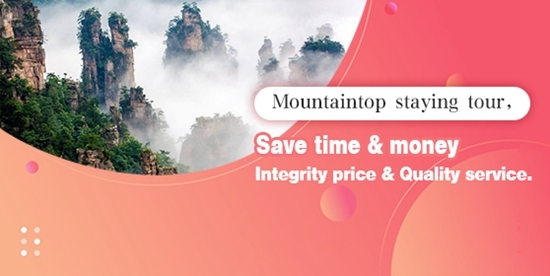 Mengdonghe River is situated 80km southeast of Zhangjiajie city, nestled among mountains, a remote canyon towering limestone cliffs, a beautiful river that’s ranked among the top ones in china. 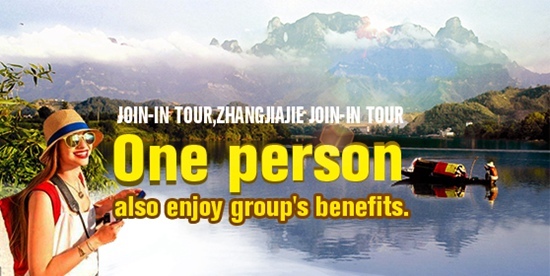 2 hours drive from zhangjiajie city, Rafting usually take 3 hours. Wide calm river section take another 3 hours ending at Furong town that’s well preserved old town famous for its old streets and stilted houses, it is worth visit.You’ll thrill to the excitement of the major rapids of the Mengdonghe River; there are a few of the rapids that get your heart pounding. 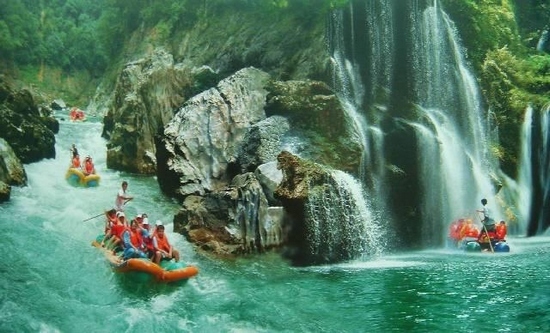 The rapids are interspersed with calm stretches, which give you a chance to enjoy the breathtaking scenery. 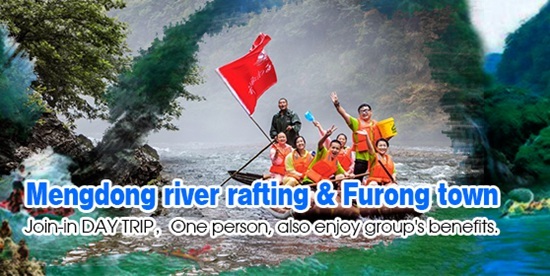 Gentle rapids carve a pathway through mountains and provide plenty of chance to swim, spot wildlife, take the fried the river fish, and just relax.Getting Prepared:Below are suggested items you should bring for your trip. You will enjoy your trip more if you are prepared for varying weather conditions.. Always Bring:Swimsuit shorts wool sweaters or synthetic fleece wool socks windbreaker jacket and pants, footwear that can get wet (plus a dry pair for after your trip) dry clothes and towel.. Sunny Days Sun screen sunglasses baseball cap or visor.Cool weather synthetic longjohns wool hat and gloves.Wet SuitCotton is not recommended (this includes jeans and sweatshirts) when it is wet it robs your body of heat and is unsuitable for physical activity. Synthetic clothing is the best.You receive instructions from guided assistance..The ticket includes insurance; the child under 13 is not suggested for rafting.